Hey everyone. It's been some time since I last posted. Not good. Not good at all!!! This past weekend we had our friends Rommel (his Blog) and Betto (his Blog) over for the weekend. They had just finished a huge scrap festival here in Brasil and needed a weekend to just chill. It was great to finally get a weekend to just make art with friends - for the sake of just making fun art!! They were kinda freaked out by all of the "stuff" I have here but were in heaven with all of the Viva Las Vegas stamps, Tim Holtz stamps, Dyan Reaveley stamps and sprays and all of the Character Constructions stamps by Catherine Moore. 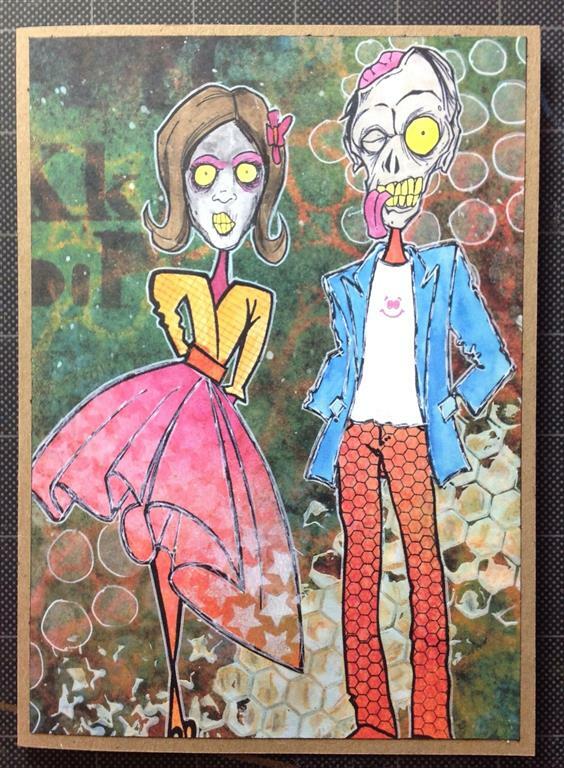 Here is the big Zombie Mixed Media piece I made. A few weeks ago I was at a stamp show and saw the Zombie Head stamps by Art Gone Willd and had to have them. I knew they would go perfect on the Dyan Reaveley Couture Stamp sets she came out with. 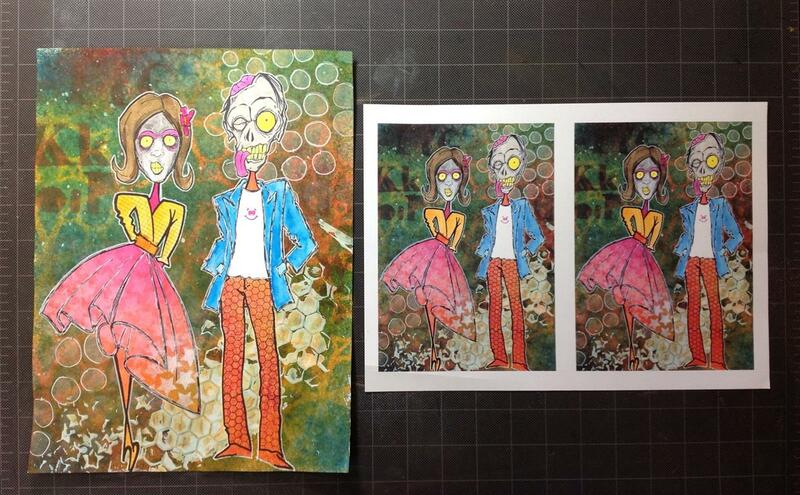 After making the big piece, I scanned it and then printed two 5 x 7's on a piece of A4 cardstock for the cards. Best of both worlds. The other day I got an email from 7 Kids College Fund that they were having a challenge on "Just Wrong" cards or other pieces of art. Since I do think that this piece is "Just Wrong", I have decided to enter it into their challenge. Check out the Just Wrong 7 Kids College Fund Challenge and their blog. No tutorial here but I will give you a simple list of what I used and a basic step by step. Because I am entering this into the 7 Kids Challenge, the links are to her store (where available). Show them some love and buy them from 7 Kids if you can!! 1 Sheet Watercolor Paper - 9" x 12"
For the background - I put a piece of watercolor paper on a craft mat and sprayed different Dylusions inks until I got the look I wanted. I then used different stencils from The Crafter's Workshop -using water in a spray bottle and other Dylusions inks until I got a bit of a textured look on the paper. I also used a hexagon stencil and some gesso in the lower right corner for additional texture. On a separate piece of cardstock, I stamped the two couture stamps using Archival Black ink and cut them out. I colored them in by spraying Dylusions ink on a craft sheet and picking up the color with a water brush. I then stamped the couture stamps again but cut the blouse (for her) and the t-shirt/jacket (for him). Colored those in with more inks and glued them to the first stamped image. Glued those pieces down over the inked background. Then stamped the two Zombie Heads, colored them in, cut them out and glued them on top of the bodies. The full watercolored sheet is just a fun Mixed Media piece. But, after scanning the piece, I printed two 5x7's on an A4 sheet of paper, trimmed them, layered it on a card front, and turn it into a card. Art Gone Wild has a cool set of phrases to go with the Zombie Heads - called Zombie Sayings, L-2659. 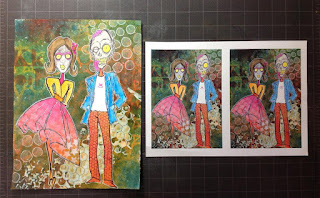 Mixed Media Piece on the left side, the A4 cardstock with the two 5x7's, on the right. 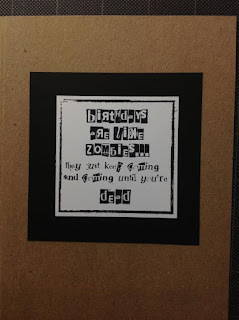 Inside of one of the cards. 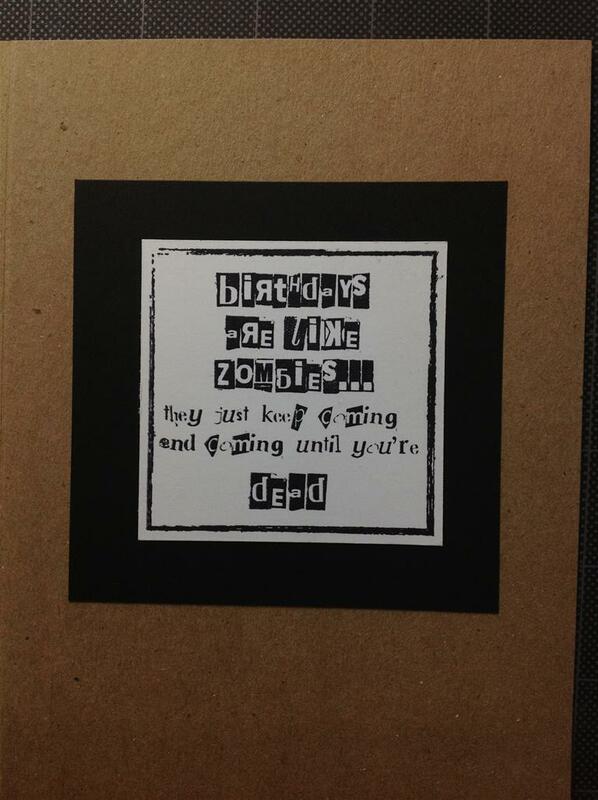 One card has the phrase "Birthdays are like zombies...they just keep coming and coming until you're dead". LOL. The other says "You're a great friend, but if the zombies chase us, I'm tripping you. Sorry." LOL again. Well, hope you enjoyed this quick post and funky project. Please make sure to check out the 7 Kids Challenge! !